Eufronio Herrera in the PROBIOMA offices, Santa Cruz, Bolivia. Photo by Nic Paget-Clarke. 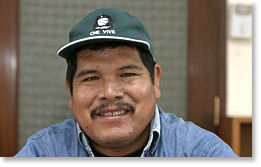 Eufronio Herrera is the president of the Consejo of the San Pedro municipality in Santa Cruz department, Bolivia and a Quechua. This interview was conducted (and later edited) by Nic Paget-Clarke for In Motion Magazine on August 28, 2006 at the PROBIOMA offices in the city of Santa Cruz, Bolivia. The interview was interpreted between Spanish and English by Mark Camburn. To see the Spanish version: click here. Eufronio Herrera: I am Eufronio Herrera. I am president of the honorable advisory of San Pedro, fifth section of the department of Santa Cruz. I live in the community of Hardemann, which is 20 kilometers from the capital of the 5th section. In Motion Magazine: How many people live in San Pedro? Eufronio Herrera: 14,644 people and in my community 3,800 inhabitants, according to the census of 2001. In Motion Magazine: And this is a rural area? Eufronio Herrera: Its a rural zone and its also a productive zone, the most productive zone of Santa Cruz and Bolivia, in terms of soya. In Motion Magazine: Many of the people in your community are farmers? Eufronio Herrera: Everybody is dedicated to, works in, agriculture. Theres no other industry. Theres not one person who doesnt work in agriculture. They either grow soy, or maize, or rice. Everything is to do with agriculture and food. In Motion Magazine: Are they mostly small-scale farmers? Eufronio Herrera: In my municipality, in the over 487,000 hectares of land that we have, 70 percent of the people are small farmers and 30 percent are large-scale farmers. In Motion Magazine: When were you elected? Eufronio Herrera: On the 8th of December of 2004, I was voted in by popular vote. On the 13th of January 2005, I took office officially. In Motion Magazine: And you yourself are a farmer? Eufronio Herrera: Yes, I am a farmer. I am not a professional. I am a farmer but also a leader of the union (sindicato) of the small farmers, of the poor. In Motion Magazine: How long has the sindicato been around? Eufronio Herrera: I have been a leader of the sindicato for 15 years. In Motion Magazine: What was the work that brought the union about and how did all of you become involved politically in the community? Eufronio Herrera: The current government has been organized and founded by movements such as ourselves; its born out of social movements. I became a leader active in this movement when we organized groups of the poor, exploited, and marginalized -- the poor people, exploited by the landlords, the people discriminated against. In Motion Magazine: So, there were people who worked on the land of the large owners as well as with the people with the small farms themselves? In Motion Magazine: What are the conditions of the people? Eufronio Herrera: At this moment, as I already said, in the municipality 75% of the land is in the hands of the big farmers and 25% is in the hands of the small-scale farmers, so we still work with landlords. We produce soy but we hand it over to intermediaries. We work as labor and farmers. In Motion Magazine: What are the main issues affecting people that you are dealing with right now? Eufronio Herrera: The problem of land, the problem of competitiveness, and the problem of the intermediaries. In Motion Magazine: What is the problem of land? Eufronio Herrera: There is a great inequality. There are people who have nothing. There are people who have twenty, thirty, fifty hectares, and there are people who have five, ten, fifty thousand hectares. In Motion Magazine: What do you think is the way to deal with that? Eufronio Herrera: We are suggesting that the government issue a new law to distribute the land more equally. In Motion Magazine: And how is that process coming along? Eufronio Herrera: The government has a project, a decree. Unfortunately, it is delayed in Congress where they are talking about it with people who represent the landowners and it is not going anywhere. In Motion Magazine: How do the people in the sindicato make their case that this needs to be changed? Eufronio Herrera: The people are organized in the sindicato, in federations, and this government has much greater contact with the social sectors, which makes it much easier for the local people to get their ideas or suggestions to the government. In Motion Magazine: You were saying that one of the reasons you think this government is in power is because of the movement of the farmers. Eufronio Herrera: Yes. The government comes from the social organizations. In Motion Magazine: And how do you work with PROBIOMA? Eufronio Herrera: As a farmer and as president of the advisory unit, I am carrying out a process, we are in the process of, reaching the people and suggesting that they use these biological products which dont damage the land or damage the earth. In Motion Magazine: Do you think there is a connection between the farmers organizing around healthy and sustainable production and also their involvement in the political situation? Eufronio Herrera: The politics before were very different to what they are now; when the intermediaries arrived with the agrochemicals and the people believed in them. Now, the people have seen that the land is being gradually destroyed by the chemicals because it is losing its fertility. They are starting to lose belief in the agrochemicals and come back to biological products, natural products. In Motion Magazine: Has that caused them to become more involved in running the community? In Motion Magazine: What do you think about genetically modified products? Eufronio Herrera: To summarize what I think of transgenics: they cause people such as myself, small farmers, to become more and more dependent on the transnational companies such as Monsanto, Cargill. In Motion Magazine: What are people doing about it? Eufronio Herrera: People are organizing themselves and suggesting to the government that they are going to plant conventional soya and not transgenic soy. In Motion Magazine: How do people organize themselves? Eufronio Herrera: The people are very much more organized. In previous years, they were not organized and they were dependent on the intermediary companies which sell the agrochemicals. As of last year they organized in groups and associations of small farmers and with the help of the government they are trying to export their produce directly to Venezuela (which is demanding conventional soy) rather than having to go with the intermediary companies. The Venezuelan market has appeared over the last year. In Motion Magazine: You were talking about land reform -- do you think land reform is the key to improvement? Eufronio Herrera: Yes, because at the moment the situation is that there are big farmers with an expansionist attitude, of ambition. They achieve this by buying up the land of small farmers. If we keep going in this direction we will wind up with the same situation as in Argentina or Brazil, where there are no small farmers. In Motion Magazine: Is there anything about your work or what people want that you would like to add? Eufronio Herrera: I would like to add that here in Bolivia, the small farmers have very little training and the big trans-national companies have led us to use agro-chemicals and we didnt necessarily know how to use them and did not know what the impacts on their land or health would be. We want that the government regulate the use of agro-chemicals in Bolivia. In Motion Magazine: Thank you very much. Eufronio Herrera: Thank you also. Published in In Motion Magazine November 12, 2007.